Beautiful, high quality hardwood flooring is treasured by homeowners everywhere for its visual warmth and timeless aesthetic appeal. But with hardwood flooring comes the risk of stripping the finish or damaging the wood. Unlike many other flooring materials, like tile or laminate, wood can be relatively delicate. Even if you’re careful, and don’t have children or pets, your beloved hardwood floors will inevitably be exposed to spills and accidents that can lead to unsightly scratches and stains. Resanding and refinishing are the usual go-to solutions, but they’re costly and time-consuming. Believe it or not, professional floor cleaning can be an effective and simple solution. 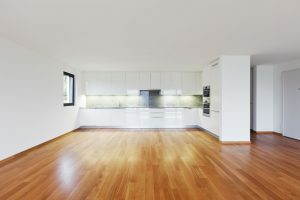 As professional cleaners, we use floor cleaning techniques and solutions developed to be safe and effective for your hardwood flooring. No self-polishing acrylic waxes. These products, useful for tile and linoleum floors, will make hardwood, slippery. Shortly after use, it dulls the flooring. No wet mopping or steam mopping. Too much moisture can damage and warp your wood floors, as well as dulling the finish. Careful waxing. Waxing adds luster to your wood floors, but over-waxing can lead to unsightly, lumpy build-up. We use a bowling alley wax for ultimate shine and protection. Aggressive dirt and stain removal. Specially designed cleaning products remove tough stains and caked-in grease and dirt, leaving your floors looking shiny and new. Occasional hardwood floor cleaning from experienced professionals can make a big different in the floor’s appearance. You’d be amazed how shiny and new a previously dull and faded floor can become. It just takes the right products, the right cleaning methods, and a little TLC. Interested in getting your hardwood floors professionally cleaned and waxed? 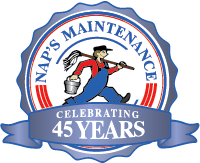 At NAPS Maintenance, we’re trained to safely and effectively clean hardwood, without causing any accidental damage to the wood or finish. To schedule your appointment, or for more information, call us any time at 508-226-4492.